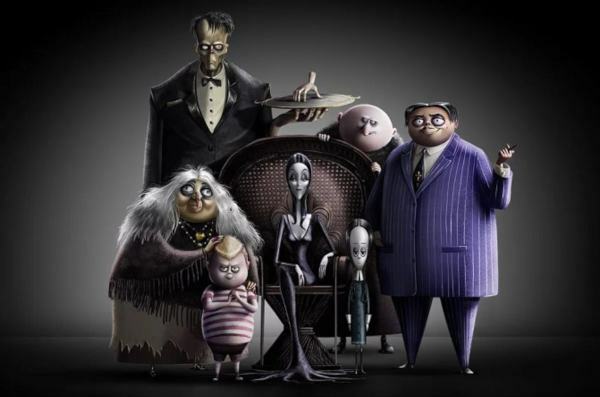 Animated comedy directed by Conrad Vernon and Greg Tiernan, based on The Addams Family comics by Charles Addams. The story follows The Addams family, whose lives begin to unravel when they face-off against a greedy crafty reality-TV host while also preparing for their extended family to arrive for a major celebration. Morticia (Charlize Theron) is devoted to her husband and children and holds her clan together. Gomez (Oscar Isaac) is passionately in love with his wife and is enthusiastic about whatever dreadful scheme he’s cooked up. Wednesday (Chloë Grace Moretz) is a brilliant teenager with deadpan wit. Pugsley (Finn Wolfhard), is a menacing 10-year-old on over-drive, getting into any kind of dreadful mischief he can find. Mad Uncle Fester (Nick Kroll) is good-natured and likes to create mayhem any way he can. Grandmama (Bette Midler) is smitten with her grandchildren. Margaux Needler (Allison Janney), the reality TV makeover queen, is consumed with a desire for absolute suburban, pastel perfection. Gomez Addams: Is that really as tight as you can make it? Morticia Addams: Wednesday, what do you have there? Wednesday Addams: I’m not sure. Morticia Addams: Strange. There’s usually a murderous clown attached to the other end of these. Morticia Addams: Don’t forget to kick your father goodnight. Gomez Addams: Pugsley, blow F6. Fire in the hole! Uncle Fester: You sunk my battleship! Gomez Addams: Well done, Pugsley. Wednesday Addams: I wish something would liven this already tedious day. Wednesday Addams: Thanks for trying, Ichabod. What do you think of The Addams quotes? Let us know what you think in the comments below as we’d love to know.